Most of the woods we work with have a very rich color tone in their heartwood. These colorations are vary among the different species of wood, and are part of what makes each of the over 150 types of wood we work with unique. That richly toned heartwood stands in stark contrast to the tree’s sap wood which is typically of a pale nature. The sap wood is the still living part of the tree’s trunk that carries nutrients and water to and from its leaves and roots. As the tree grows, it puts on new rings of sapwood, which as they age and die, become a hardened structural element of the tree usually with some form of rot resistance as you can see in this Bois d’Arc branch. The sapwood is chock full of bug holes, but none of them penetrate the yellow heart wood. Many of the exotic woods we work show this rot resistance. You can also see just how thin of a layer the sap wood really is. It’s just a few growth rings below the bark of the tree. 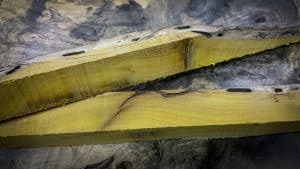 For this reason it is very rare that we can actually make usable blanks with sapwood in them. But as you can see in the photos below, when we do though, the results are quite striking. This run is what we’ve garnered over the past couple of years of saving up these sapwood blanks. 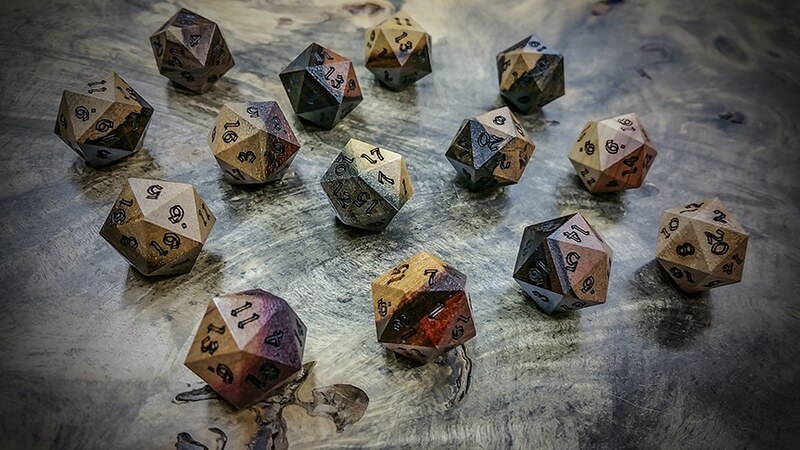 We’ve recently made full polyhedral sets from these blanks, which you can find here, but some of our customers wanted just single d20s, so we’ve crafted 14 of these beauties.